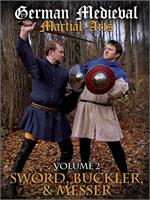 A late-medieval sword duel from a contemporary image. n the last few months, I have had a chance to deepen my understanding of judicial-dueling jurisprudence, especially as it developed in Italy in the era of Fiore de’ Liberi. I will post a few of my findings here, hoping that they will be of interest to the students of the subject. 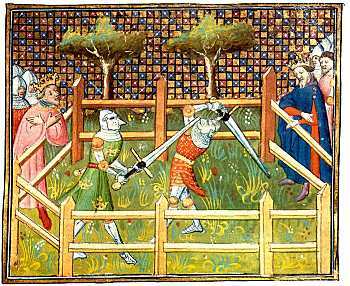 Let us start from a reliable period definition of what a duel was as commonly understood in the fourteenth century, and how it differed from other kinds of physical and violent ways in which to settle disputes. According to law-historian Marco Cavina, we are on solid ground when looking for this definition in the writings of fourteenth-century jurist Giovanni da Legnano, who authored an influential treatise on the subject in the period that interests us. Entitled Tractatus de Bello, de Represaliis et de Duello, Giovanni’s treatise defines the duel as “a deliberate physical fight between two, for purification, glory or augmentation of hatred.” The author then specifies that those for glory and augmentation of hatred fall outside the scope of duels as commonly understood at the time, leaving the third specie (gratia purgationis) as the only fitting subject for the rest of his treatise. Giovanni describes this type of duel as one by which a person accused of a misdeed can, lacking preponderant evidence, purge or purify himself of the accusation by proving his case through physical strength (viribus corporeis), and traces the roots of this practice to Lombard law. The duel emerges as a legal proceeding of sorts, between an accuser and a defendant, to unfold through actions of physical strength, and following the dictates of centuries-old jurisprudence. Giovanni da Legnano, the jurist who authored an influential text on dueling law in the 14th century. arms. Although scholars disagree about whether Giovanni da Legnano’s definition pertains to the duel of honor, they concur that this form of preordained single combat gradually replaces dueling as an ordeal between the eleventh and the fourteenth centuries (as we will see later in more detail). Perhaps the earliest extant records of dueling to settle legal disputes are in the Lombard Edictum Rothari (AD 643), where it appears as a privilege of the higher class, the liberi. Between that time and the eleventh century, it remains an established juridical procedure in Italian common law for cases lacking material evidence, with the outcome (the judgment of God) having legal force. Dueling for honor comes into being and grows in importance when, between the eleventh and fourteenth centuries, the bellicose values of the feudal knightly class gradually harmonize with the ethos of the nascent urban nobility, which emphasizes honor. In particular, Cavina theorizes that the chivalric code, centering on the cult of the oaths of fealty and of the value of a word given, would become the glue that holds together the aristocratic class. Accordingly, by the mid-1300s the judicial duel for the point of honor is so ingrained in the mores of the Italian nobility that jurist Giovanni da Legnano begins treating is as an institution of natural right (ius naturale). Meanwhile, theologians and moralists gradually reject the idea of dueling—with the violent death that often comes as a result of this practice—being compatible with biblical and Christian doctrine, although this happens slowly and not without significant exceptions. For instance, there is the fact that an appropriate missa pro duello functions as one of the opening rites before combat, that clerics known to have taken part in duels are at times still allowed to celebrate mass, and that even Thomas Aquinas condones dueling in the Summa Theologica. Even in spite of these exceptions, the attitude of theologians remains one of increasing intolerance for dueling. Finally, dueling becomes the target of increasingly-frequent papal attention in the sixteenth century, until the council of Trent (ending in 1563) makes it categorically illegal under canon law, thereby turning it into an underground activity. Stay tuned for more information about this fascinating topic, including first-hand accounts of duels in the time in question! Cavina, Marco, Il Duello Giudiziario per Punto d’Onore: Genesi, Apogeo e Crisi (Sec. XIV-XVI)(Turin: G. Giappichelli Editore, 2003), 63-70. 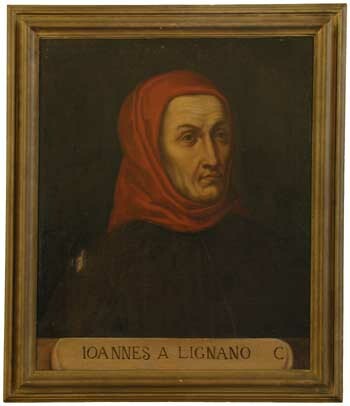 Cavina states that Giovanni da Legnano completed the treatise in 1360 and that, based on the number of surviving commentaries, it was a highly influential work on the subject. These are, respectively, dueling in tournaments (or as public spectacles) and acts of private, premeditated aggression between two rivals, the latter including such ideas as the vendetta. See Cavina, Il Duello Giudiziario, 68. Cavina, Marco, Il Sangue dell’Onore (Rome: Editori Laterza, 2005), 8. Cavina, Marco, Il Duello Giudiziario, 67. Cavina, Il Sangue dell’Onore, 17.